Trade wars are not good or easy to win, contrary to President Trump's tweet. What lies ahead may be an extended period of economic conflict, or worse. Fifty years ago, the assassination of Robert F. Kennedy shocked the nation. Had he been elected president, no sure thing, he would have faced a nation in many ways as divided as today. But whoever won in 1968 — RFK, Eugene McCarthy, Hubert Humphrey, Richard Nixon or George Romney — would have continued American leadership on world trade. That part of the post-World War II consensus — lowering barriers and encouraging a rules-based system of international commerce — endured. President Trump marks a break, probably decisive, on one of the most important American achievements: A liberal global trading system that lifted a billion people out of poverty and helped ensure peace among major powers. It was one of many elements that made America great. 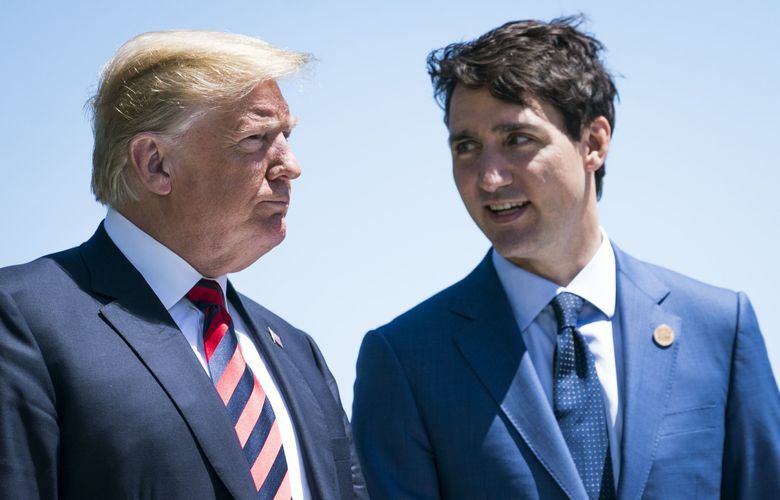 Thus, Trump demanded a renegotiation of NAFTA, putting down impossible demands on Canada and Mexico while terrifying American companies dependent on the ties of the three nations. He imposed tariffs on steel and aluminum, including for close allies such as Canada, Mexico and the EU. He’s threatened sanctions and even an all-out trade war on China. Concern over unfair Chinese practices and theft of technology is real. Trump’s strategy, however, is destructive. I’ve written extensively on the consequences for Washington, one of the nation’s most trade dependent/vulnerable states and the biggest exporter to China. This past week Mexico responded to U.S. tariffs with its own, including levies on apples. Mexico is Washington’s biggest apple export market. Trump’s abandonment of the America-led liberal world order is likely decisive because he’s not alone. Much of the left and the right have become convinced that America is being hurt by trade. Bernie Sanders, a sometime Democrat, railed against globalization in the 2016 primaries. His traction forced Hillary Clinton to abandon the Trans-Pacific Partnership, which would have been the signature trade achievement of the sitting president of her party, Barack Obama. How will this turning point look 50 years from now, assuming we still use the written word or allow the objective study of history? Imagine this. In 2068, the United States has recently concluded the second Sino-American war. Once again, the outcome was a draw with heavy losses on both sides. Only a few cities were lost in the limited nuclear exchange, a few million souls. But the shaky armistice and hatred on both sides almost ensure that peace won’t last. Another casualty was the largest and most important trade relationship on the planet. Young people can’t remember, or imagine, that America and China were once closely linked in peaceful exchange. In this future, America is much poorer, and not merely from the direct costs of war. A half century before, the United States did $3.8 trillion in export and import business all over the globe. A steady decline began after the tariffs in 2018 set off reciprocal barriers by the targeted nations. American allies drifted away, charted their own course. Many, eventually even Mexico, joined China’s Belt and Road Initiative, a global economic order led by Beijing. When the two-term Trump administration abandoned the North America Free Trade Agreement, millions of jobs were lost in the continental supply chain. Many of them were American, never to return. Mexico, which elected a far-left president in response to Trump’s hostility, was badly wounded. Huge numbers of economic refugees surged across the border, wall or no. Trump’s frustration with China eventually led to widespread tariffs, with Beijing responding in kind. At the time, Boeing being shut out of the Chinese market seemed a hammer blow. But it was a mosquito bite compared to when Beijing stopped showing up at Treasury bond auctions — then began dumping Treasuries. It was by far the largest holder of U.S. debt. Out of self-preservation, Japan and others followed. With Treasuries losing their status as the world’s safe-haven investment and the dollar gutted as the global reserve currency, the United States essentially lost its unlimited-balance gold card. Of course, this financial blow hit China, too, as its American holdings lost value. But with its centrally planned economy and authoritarian state, it was better able to withstand the world depression than most nations, especially the diminishing number of liberal democracies. Whirlwind inflation, economic collapse and social instability hammered the West. The first Sino-American war soon followed. Japan and Korea — even Canada — remained neutral. NATO by this time was only a memory. The few who study history 50 years from now will learn that the American-led world order was instituted after the carnage of World War II specifically to prevent such an outcome. Leaders of the WWII era believed the trade battles of the 1930s led to real battles in the 1940s. They will wonder what happened. Historians will debate what went wrong. One major cause, they’ll hypothesize in 2068, was the primacy of debates over identity and cultural issues in the United States, both on the right and left. Real or imagined economic issues were secondary to white-majority anxiety vs. the left-wing ideal of open immigration. Another theory is that America and China had fallen into the Thucydides Trap, where a rising power collides with the established leader. It happened in ancient Greece and again in World War I.
Revisionist historians in 2068 lay out other contentions, downplaying China-U.S. rivalry. They argue that trade was unfairly scapegoated by some politicians. In reality, the disruption to American jobs from global supply chains was largely done by 2016. The big causes of rising inequality and stagnant incomes lay elsewhere, among them tax cuts for the rich, the power of monopolies and cartels, and falling public investment. Another revisionist school says the failure of America to lead the Trans-Pacific Partnership was a critical blunder. Not only from an economic standpoint, but one of stability. It would have helped contain China, offset its worst trade practices and ensure its peaceful rise. The United States’ alienation of its allies and abandonment of the liberal order began with dropping TPP. One of the most provocative theories is that climate change and population overshooting the planet’s resources — some 10 billion by the 2060s — made collapse of the American order inevitable. Back in 2018 now, I don’t want to subscribe to this future. Remember the iconic scene in Terminator 2, when Linda Hamilton’s character is carving “No fate” into a table with a combat knife. “There’s no fate but what we make for ourselves,” her son explains to a curious terminator. We can make other fates. Trump could make some cosmetic changes to NAFTA, roll out TPP under his own name and declare victory. Or voters could make their own trade, in the next elections.